The Glenlochy just shaded it. Never did a tasting note for this one before, its long overdue. Even more lively now, sherry to the fore with still the brown sugar and hints of orange, ripe plum and juicy black raisins. Complex, so much going on and ever so slightly rough because there is a battle going on between the sweet fruit and slight bitterness from the old sherry cask. This is great and for me bottled exactly at the right time before it started getting too woody. Burnt brown sugar, caramel, very resinous , dark orange liqueur, milk chocolate, prune, dark raisins , dark treacle. You get the picture, its very rich. Wow that is powerful but creamy and syrupy with it, the orange and dark treacle are on the palate but its lighter than the nose suggests. Very zesty with hints of raspberry sherbet and fried peels, orange/lemon. Long and rich. mouth coating to the end. 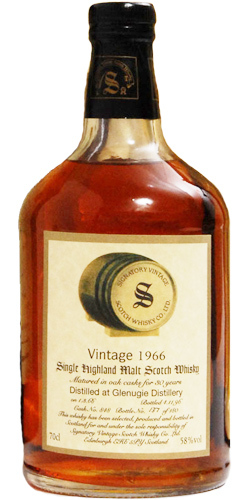 The best Glenugie I ever tasted and came across, a rareness of great class. A pitty that they are hard to find. A true ACE!!! Full and rich, sherry notes and liquer bon-bon (reduced: dried fruit and pure chocolate very complex). Pungy, sweet and intense (reduced: chocolate flavors, dry and very tasty). Very nice, reasonably long with a wonderfull echo of dried fruit and oak.